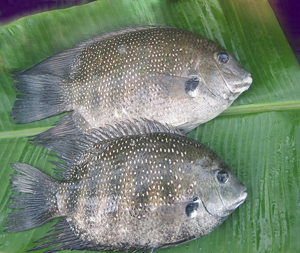 The Pearl spot, Etroplus suratensis commonly known as “Karimeen” in Kerala is an indigenous fish extensively found along the east and south-west coasts of Peninsular India. It is an important candidate species for aquaculture in ponds in both brackishwater and freshwater environments. It is cultured in traditional ponds in Kerala where it is considered a delicacy fetching a high price up to Rs. 150/ kg. Though growth is slow, at a high stocking density table-size fish can be harvested in 9-12 months culture period.